Fortunately, a fledgling movement sees the dawn of a positive future, despite sobering realities of precarious petroleum dependence and global warming. 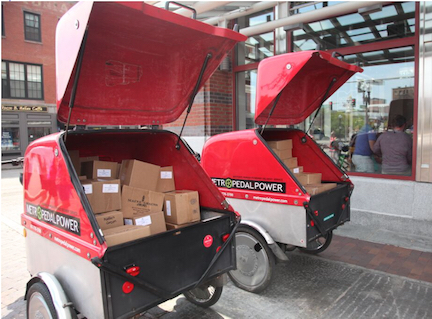 Sail Transport Network served as inspiration and encouragement for both projects. 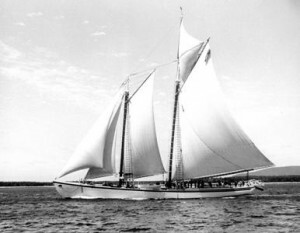 Some of us in the sustainability/resilience movement wonder why there isn’t more sail transport in this age of Peak Oil, climate destabilization, and the widespread appreciation of local food with a low carbon footprint. But whatever the reasons for momentary blindness among those who ought to be supportive, we are confident that with every new project and the resultant public awareness, the trend for more sail power is surely upward. 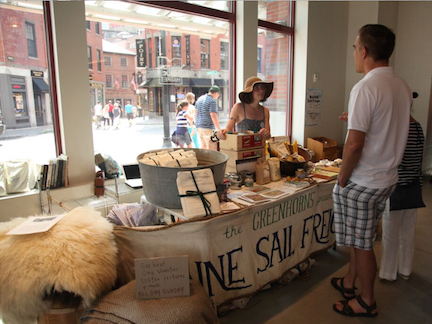 When the maiden voyage was completed, Maine Sail Freight announced that it "used the power of the wind and the romance of the ocean to remind our community of the compelling landscape logic — sell food more regionally, diversify our landscape, and coordinate our trade along rivers and down coasts for a more resilient food system.” One single accomplishment exemplifies what's happening: it has been about a hundred years since cargo schooners sailed the waters of Penobscot Bay, and that place and time enjoyed almost full sustainability — notably with a much smaller population that consumed much less per capita. 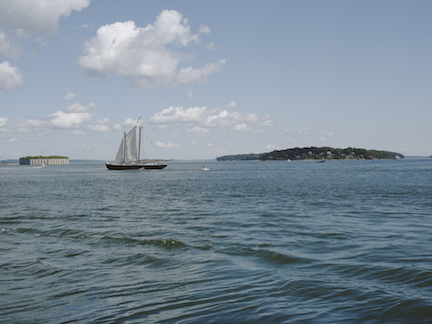 The Adventure’s role was not purely an ocean departure: “We did two riverboat parts of the adventure — the Kennebec and the Piscataqua, as we think that the watershed is perfectly functional logic for rebuilding food economy,” Severin von Tscharner Fleming told STN. 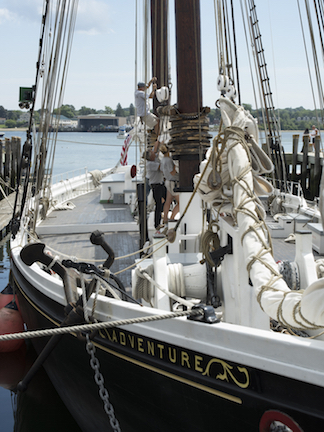 On August 23rd these riverboats sailed down the historic North Haven thoroughfare to Portland, to connect with the Adventure. 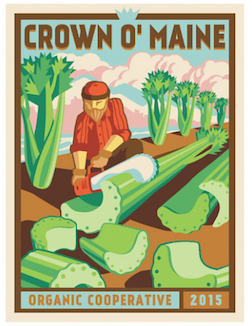 There is another integral partner with Greenhorns and Maine Sail Freight: Crown of Maine Cooperative, a food supplier that helps with sail freight logistics. The products aboard included: blueberry jam, mustard, pickled dilly beans, cashmere goat pelts, wool yarn, honey, maple syrup, dry beans, and Fiddlers Green biscuit mix. “These are quintessentially New England products, proudly ‘value added’ and ‘non perishable’ so we can sell them all month long at the public market. For practical reasons, these are the kinds of products that young farmers are making more of — we need cashflow through these long, and lengthening winters,” stated Greenhorns. 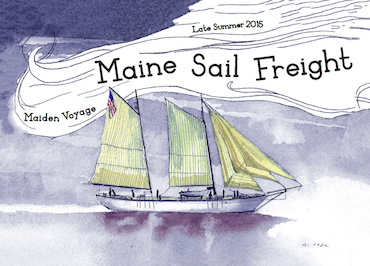 As a reader might guess, the maiden voyage for Maine Sail Freight had to be well organized to get the maximum effect from a cooperative effort: cargo partnerships with Fiddler’s Green Farm and Crown o’ Maine Organic Cooperative made the enterprise possible, along with the support of Boston Public Market, Experience Maritime Maine, Penobscot Marine Museum, METRO Pedal Power, and more. 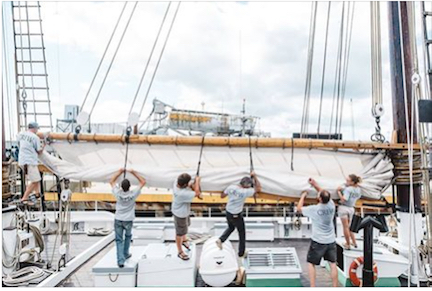 Sailing from Portland, Maine on Aug. 27th, the 122-foot long schooner Adventure carried the 11 tons of high-value cargo for Maine Sail Freight’s voyage to Boston Harbor, arriving August 30th. 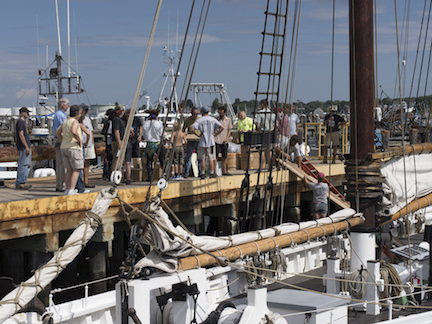 Unloading ceremonies, panels, presentations, shanties and fanfare, along with pedal power transport, made for a fun splash — for anyone involved or witnessing it, it probably meant the highlight of the summer or even the whole year. 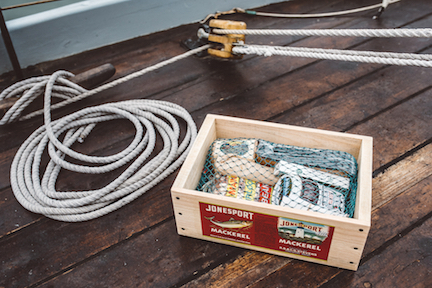 A farmer-oriented sail freight operation is a bit different from Netherlands-based Fair Transport which originated as a sea-captain/boat-building project. Von Tscharner Fleming told STN, "Sail transport for a region like Maine, practically bursting with new organic farms, gives us a platform for regional marketing, a great gimmick to draw attention to the New England food region, and all the logic in moving food down through the landscape, to the port cities, to the harbor cities, to the market/ wharfs of those cities, to where customers can come and buy the food using public transportation." Von Tscharner Fleming also revealed to us elements of the plan essential to expand and deepen the concept of Maine Sail Freight: "In chosing to move freight by sail, we recognize that dollar for dollar, pound for pound, we can never compete with super-tankers or even box trucks on the highway. 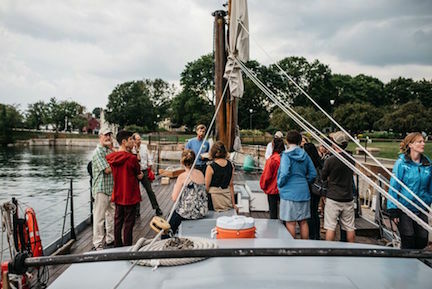 But by padding our voyage with programing, educational happenings, dockside dinners, boat tours, history lectures, sea-shanties and public engagement, the boat becomes a character in a larger narrative, and the stage for a set of activities beyond transportation. 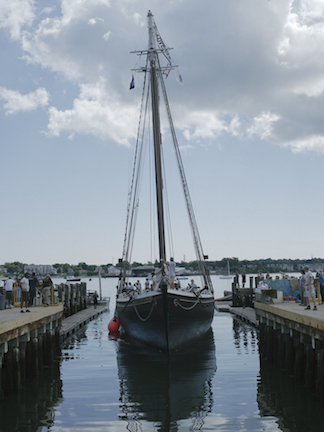 The boat becomes an icon, a field trip, a marketing device, an atmospheric enticement for advocacy. 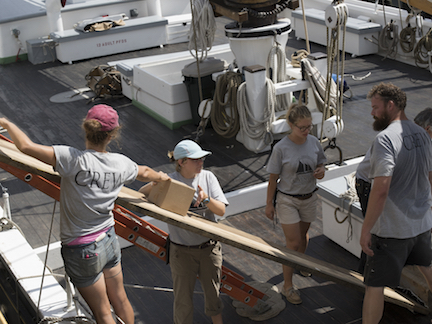 This also means that the cargo doesn't have to bear the full cost of chartering and crewing a sail voyage. 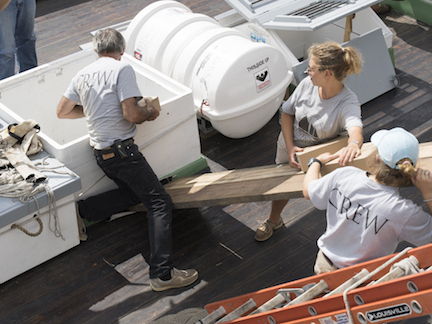 As we learn more and more about what it takes to move cargo by sail, the considerations in docking, loading, insurance, packing, supply-chain management, and building a marketplace for this unusual trade — we can share that information beyond the non-profit sector, for the benefit of captains, boat owners, and those who can 'plug in' for an occasional haul between ports." Hear, hear! Sail on. 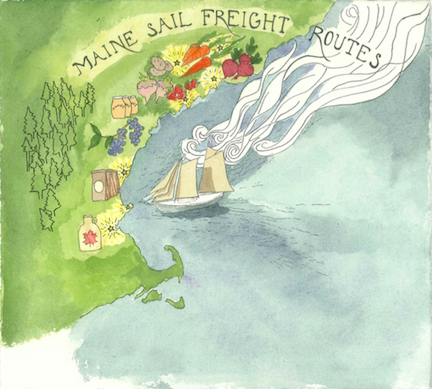 We wish Maine Sail Freight many years of good crops and fair winds. The Adventure is at left. 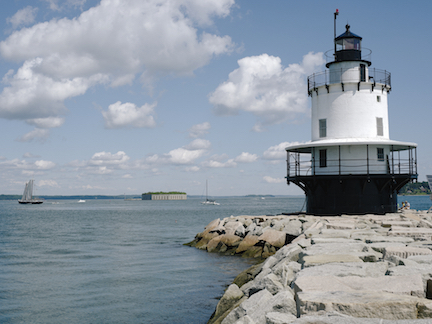 As a former resident of Portland, and a part time resident of St. George ME, I can honestly say that the sparse population realizes the value of local cooperation and natural wealth. Lets hope that population stops growing on this planet. A 300 % increase in my 70 years qualifies as biological Plague Phase. We are a cancer on the planet, and nature will put us back into balance with or without our help.